Are you a horror fanatic? Are you always on the lookout for new ways to express your intense passion for the dark and macabre? Would you like to connect with other people to find out more about your shared interests? If your answer to these questions is yes, you will need to pay close attention to the following eight tips. They will provide you with plenty of inspiration and will help you to learn even more about the world of horror. One natural step is to plan a movie night for you and your loved ones. This is a brilliant opportunity for you to introduce your nearest and dearest to your love of horror. It is also a great chance for you to find out about movies that you have never seen before. Why not encourage everyone to bring along their own suggestions? Then, you can all give informal pitches to the group before you take a vote. If you are going to keep everyone coming back for more, just remember to provide plenty of refreshments. You should also reorganize your furniture so that there is more than enough comfortable seating to go around. When you are preparing your refreshments, it is important that you continue to embrace the theme of horror. Whatever you do, don’t just opt for the corny approach of naming your food and drink with different puns. Instead, you should work hard to ensure your refreshments have what it takes to stand alone. Why not check out Pinterest for creative ideas? You could also search YouTube for interesting cocktail recipes. Not only is this a great opportunity for you to have fun in your kitchen, but it is also a great excuse for you to evaluate your horror collection. After all, you will need plenty of ideas if your refreshments are going to pack a punch. If you want to take your love of horror even further, you should think about organizing a trip away. Instead of opting for a generic vacation, you should be on the lookout for a travel opportunity that celebrates your number one passion. This may sound like a complicated process, but there are actually plenty of options for you to choose from. For instance, if you are interested in traveling to Ohio, you should visit Put-in-Bay. This is a great way for you to surround yourself with paranormal activity that will excite your senses and satisfy your love of all things spooky. Another brilliant option is to enjoy a moonlit walk. For some, this might be a romantic experience. However, depending on your approach, this could be a seriously spooky activity to undertake. This is especially likely if you decide to go on your moonlit walk after watching one of your favorite horror movies. Just imagine the tricks your mind will play on you if you get the setting right. Although it is important that you enjoy an adrenaline rush, it is even more important that you are safe. That is why you should only carry out your moonlit walks with a group of reliable loved ones. Next, you should try your hand at creating a spooky soundtrack. This is a great way for you to enjoy your love of horror wherever you are and whatever you are doing. If you are wondering where to start, why not look through your collection of horror movies? Then, you could download specific songs from their soundtracks. You could also keep your eyes peeled for songs that are inherently scary, regardless of their connotations. Once you have created your playlist, you will be able to play it whenever you host a horror themed event. One such horror themed event is a fancy dress party. This is a fantastic event to organize if you are a creative person who loves to be center of attention. Even if you are a little more reserved, it could still be a great chance for you to enjoy all of the outfits your loved ones come up with. If you decide to push forward this plan, you should aim to invite as many people as possible. That way, all of your guests will have plenty to talk about. Instead of being able to take in everyone’s costumes at first glance, your guests will be forced to mingle. They will also be met with constant surprises as they discover new ensembles. You could even ask everyone in attendance to vote for the best dressed and then reveal the winner at the end of your party. 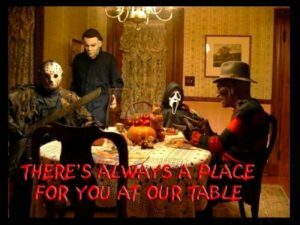 You can also enjoy a horror-themed social gathering by setting up a club. This could be anything from a book club to a film review session. Whatever you decide, the most important thing is that you have a chance to enjoy the company of like-minded individuals. Why waste your time convincing others to give a horror a try, when it is possible for you to surround yourself with fellow enthusiasts? It might be an exciting opportunity for you to get involved in heated discussions about the best projects out there. It could also be your best chance of staying on top of the latest releases and exploring areas of the horror community that you would previously never have thought of. Finally, you should have a go at creating your own art. Don’t worry; this doesn’t have to be a professional pastime. This could just be a fun way for you to spend your free moments. You could write a book, a collection of short stories, or a piece of poetry. Alternatively, you could treat yourself to a video camera, and endeavor to create your own snippets of a horror movie. Or, you could get experimental with some artwork. Why not use this as the perfect excuse for you to let your creative side run wild?